We regret to know that your experience was not a positive one. We understand that your order was cancelled per your request. 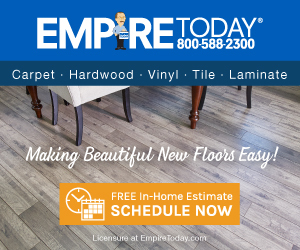 For future inquiries, please contact customersupport@empiretoday.com. I had an empire sales rep at a house i am trying to sell. After he acted like he knew what he was doing he used his I pad and gave me a price of 6,500.00 for the cheapast carpet he showed me and for only 1100 sqft. I asked him about the special they run on TV and he said that this just expired yesterday. At that time i knew i had a lier infront of me. i told him to leave and walked him out. All of a sudden he said how would 2,500.00 sound. He dropped 4000.00 within a few feet of walking. We then went through his i pad and when it came to payment he asked if i want ti finance which i said no and that i pay cash. He then asked if i want to pay in full immediatly, or make a downpayment or pay at the day of installation. Now since he lied to me that much and dropped the price by 4k i told him i dont trust them and that i pay once the carpet is installed and i am satified as it should be. ( or at least thats how it used to be when we still had honest companies)He was fine with this and we signed the agreement. The day before the install i get a call to verify the install by being told i owe immediatly 2.5 k upfront before they come. I told the very rude woman (not Lady) that i wont. The sales rep called me you know the lieing one and told me that this is company policy. i did remind him about our agreement and he basically was mumbling that i give the installer a check before they start but some with a certificate that i must be satisfied. (oh yessssss) been there done that. they walk with the money and they never come back. (but as we all know we do have the right to sue and hire one of those ambulance chasers) Never ever do i trust a service company and pay for a service upfront. Review #898588 is a subjective opinion of User898588. Thank you for your comment. I need a company I can trust. This one is obviously not it. We sense your frustration and regret to hear that your experience has not been a positive one. We want to help make things right, but unfortunately are unable to locate your account and contact information. Please email us at customersupport@empire-today.com so we can start working towards a solution.